IOBit Protected Folder will password-protect your folders and files from being seen, read or modified. It works like a safety box, just drag and drop the folders or files you want to hide or protect into Password Folder, then no one can see, read or modify them. 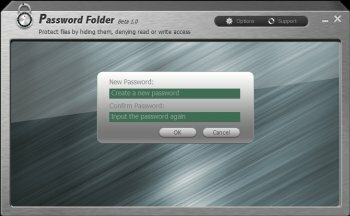 Whether you are concerned with privacy, data theft, data loss, or data leaks, Password Folder is an ideal tool for you. This is helpful for business people to protect important files. Nice clean interface. It works really well. It's very easy and worth every penny. This application is very easy to use. Protected Folder works like a safe. You can just drag and drop to put files or folders you want to keep it in the safe. Great! I share my desktop with other people (we have separate accounts) so that he could do his assignments and I frequently work outstation for weeks. Everytime I came back, I found that my files stored in another partition always got messed up by his friends during group assignments. Having this software to lock my files & folders from being modified is very welcoming. I was so amazed by it speediness in launch, hide, lock and protect. Very light weight it seem. More impressive to me is that after uninstall, all protected folder automatically unhidden and returned to its original, even I did not do so before uninstall. With this, I really feel secure with Protected Folder. I am always using some form of 3rd party software to protect my folder. Protected Folder is only of many alternatives, but a good one. Very easy to use drag and drop features. Whether you are concerned with privacy, data theft, data loss, or data leaks, Protected Folder is an ideal tool. Easily block access to files, folders, and programs you choose. Then others can see it but cannot access, read or view its content. This program really helps me to keep my files safe. Just drag in, and the file is protected. Feel secure with my business documents. Thanks.